Delving once again into the architectural photographers archive here is yet another project I have unearthed; Brunel University’s refurbished Wilfred Brown Building by the London-based Sheppard Robson architectural practice. Almost immediately after completing the photography of One Creechurch Place in late 2017 for the same client another completed project awaited me, this time in the form of the Wilfred Brown Building which houses the College of Engineering, Design and Physical Sciences for Brunel University. The project can be found situated amongst the University’s large campus located on the fringe of West London in the town of Uxbridge. The Wilfred Brown Building was originally delivered by Sheppard Robson in 1968 followed by a rooftop extension in 1990. 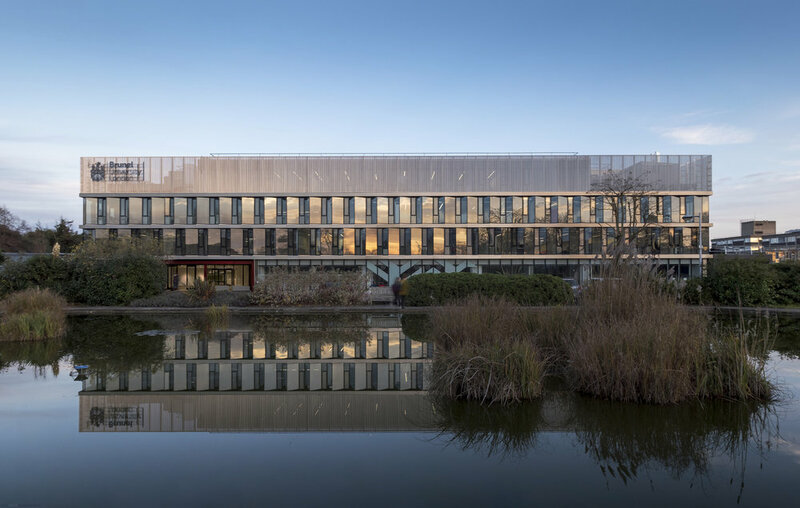 Like many Universities, findings itself amidst a flux of expansion in student numbers and a need to accommodate cutting edge learning facilities Brunel commissioned a modernisation of the building. Relieved of its aging skin the structure was stripped back to its concrete frame and re-clad with a ‘saw tooth’ facade, which according to Sheppard Robson is comprised of a ‘north-west facing clear glazing and west, south-west facing glazing with interstitial architectural mesh to provide solar shading’. Situated above this is a crown of perforated profiled metal which compliments the glazing below. The building, situated on the universities western boundary is accompanied by a quaint pond - home to several ducks and a scattering of Water Lilies - creating an idyllic microcosm amidst the hustle and bustle of campus activity. For any trivia buffs, an episode of the BBC comedy Cuckoo was filmed outside the building when the families son attended an unnamed University. When photographing the building it came to my attention that one of the aesthetic qualities the jagged facade expertly accentuates is a reflected sunset, as seen in the Miami-esque shades of pink and orange intermittently captured along the glazed panels. Internally the building is fitted out by Sheppard Robson’s interior design department ID:SR. Due to its multiple uses, a variation in the design elements and application of colour make an intuitive and easily navigable space. Corridors and open spaces are punctuated by both private and public study areas, formed from colourful sofas and chairs which offer both comfort and a level of concealment. Other rooms are home to more specialised equipment, assessment, interview and meeting rooms, as well as several large spaces for lectures and faculty meetings. As when having photographed other University buildings in the past, a brief exposure to campus life is enough to draw on a sense of nostalgia for a simpler, more fun, albeit debt driven way of life, compelling one to abandoned the strictures and ennui of working life and take up a lengthy degree course.